If you are walking near Union Square in downtown San Francisco, make sure you look up as you make your way down the sidewalk. Several stories above ground, you'll see a tiny wooden pioneer's cabin clinging to the side of a ten-story hotel. Is it a real cabin? Can one go inside it? Has the building designed a new space? If you look more closely, you will see a plaque on the side of the Hotel des Arts which identifies the cabin as a temporary art installation called "Manifest Destiny!" On display until October, 2012, Manifest Destiny! is the product of a collaboration between two designers; San Francisco-based Jenny Chapman and New York-based Mark Reigelman. 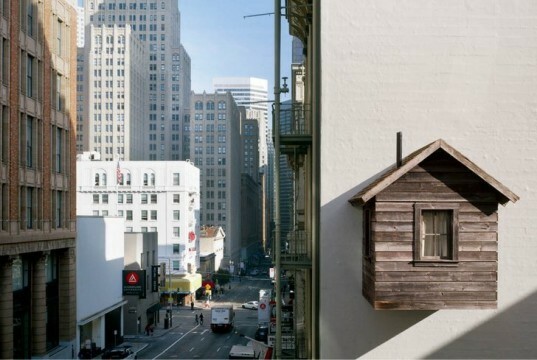 Their first project together, the idea to build the tiny cabin in a space between downtown San Francisco’s tall buildings came together in only a few short weeks. After meeting at a conference in April 2010, Mark and Jenny applied for a grant to create a new work of public art in the Bay Area. Focused on the “spaces between buildings”, the newly minted partners pulled together a grant application in only ten days. 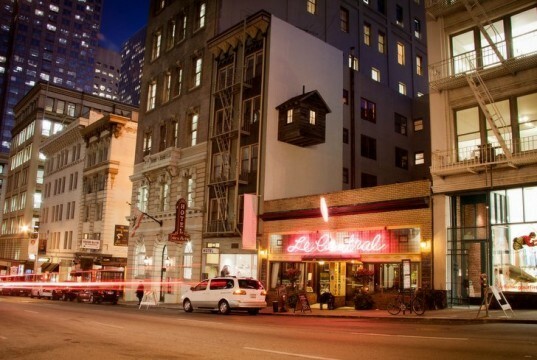 The team contacted over fifty building owners in downtown San Francisco seeking a site for their proposed project. Originally, they had hoped to install three different cabins, but eager to begin construction, decided to focus on the Hotel des Arts site. One of the biggest challenges the designers faced was proper permitting regarding property lines – because the Manifest Destiny!cabin juts out past the property line of the hotel it is attached to, technicalities related to boundaries posed a problem. The Manifest Destiny! cabin is built from naturally aged wood, which was sourced from an Ohio barn built in 1890 by E&K Vintage Lumber in Los Angeles. The barn wood was used as-is and reclaimed to create the cabin’s authentic look. Inside the barn wood cladding, a modern aluminum frame provides the structural support neccessary to suspend the cabin to the side of the hotel several stories up. Although the cabin looks like a simple construction, attaching it to the side of a building presented architectural and engineering challenges such as compensating for the weight and adding electricity. Since the design included lighting the cabin at night, but the building permit didn’t allow the piece to connect to the electrical grid, the artists decided to use solar panels. Finding lightweight yet powerful solar panels that could power a bright light was a challenge, but the designers eventually created a solution with a 4X4 foot solar panel and a dusk/dawn switch sourced from San Francisco’s Urban Farmer Store. Paired with a car battery for power storage, the sun provides the power to run Manifest Destiny!’s cozy cabin lights throughout the night. The actual building process of the cabin was collaborative, including lots of input from structural engineer Paul Endres, general contractor Roman Hunt, and the owners of Pseudo Studio where the cabin was built. Sheedy cranes were on hand to install the cabin several stories above street level. The designers were not afraid to embrace a complicated subject. While the cabin is cute and photogenic, the concept behind it is difficult. While many viewers have interpreted the piece in different ways, the genesis of the project is a comment on history and the settling of California. Jenny Chapman discussed the multilayered meanings behind the title of the piece: Manifest Destiny!. The theme represents the spirit of adventure embodied by pioneers, yet is also critical of the arrogance behind western expansionism and mistreatment of the west’s existing inhabitants by settlers. The drive for a better life underlying the spirit of pioneerism is represented in the idea of Manifest Destiny, yet the concept also points to the idea that there was a god-given right to settle the territory. As Chapman put it, Manifest Destiny encompasses: “the horror of the native condition in California but also the enthusiasm of settling the West.” As a piece of public art in a private space, the Manifest Destiny! cabin itself is inhabiting an “unclaimed territory” several stories above the ground. With one successful collaboration already under their belts, we look forward to seeing more surprising public works from Jenny Chapman and Mark Reigelman. To see the Manifest Destiny! cabin yourself, head over to 447 Bush Street in San Francisco before October 12th, and check out more details from arts grantmaking organization Southern Exposure. On display until October, 2012, "Manifest Destiny!" is the product of a collaboration between two designers; San Francisco-based Jenny Chapman and New York-based Mark Reigelman. 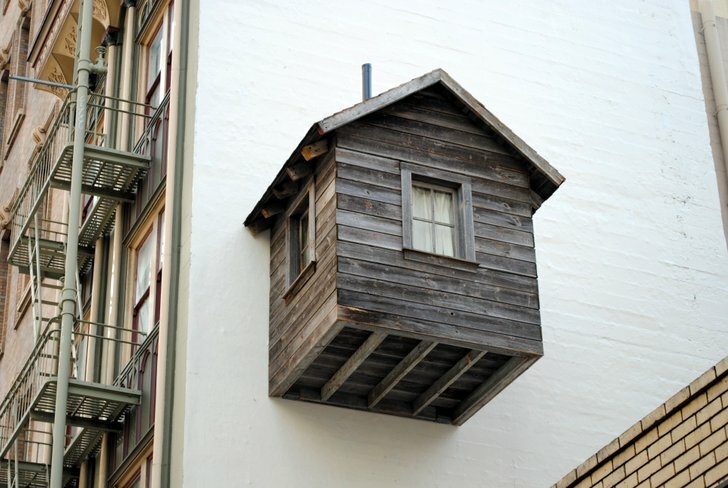 Their first project together, the idea to build the tiny cabin in a space between downtown San Francisco's tall buildings came together in only a few short weeks. After meeting at a conference in April 2010, Mark and Jenny applied for a grant together to create a new work of public art in the Bay Area. Focused on the "spaces between buildings", the newly minted partners pulled together a grant application in only ten days. The "Manifest Destiny!" cabin is built from naturally aged wood, which was sourced from an Ohio barn built in 1890 by E&K Vintage Lumber in Los Angeles. The barn wood was used as-is and reclaimed to create the cabin's authentic look. Inside the barn wood, a modern aluminum frame provides the structural support neccessary to suspend the cabin to the side of the hotel several stories up. We sat down with Jenny in San Francisco to learn more about this fascinating and original new piece of public art. The team contacted over fifty building owners in downtown San Francisco seeking a site for their proposed project. Originally, they had hoped to install three different cabins, but eager to begin construction, decided to focus on the Hotel des Arts site. One of the biggest challenges the designers faced was proper permitting regarding property lines - because the "Manifest Destiny!" cabin juts out past the property line of the hotel it is attached to, there were complicated boundary line technicalities. Although the cabin looks like a simple construction, attaching it to the side of a building presented architectural and engineering challenges such as weight and electricity. The designers were not afraid to embrace a complicated subject. While the cabin is cute and photogenic, the concept behind it is difficult. While many viewers have interpreted the piece in different ways, the genesis of the project is a comment on history and the settling of California. Since the design included lighting the cabin at night but the building permit didn't allow the piece to connect to the electrical grid, the artists decided to use solar panels. Finding lightweight yet powerful solar panels that could power a bright light was a challenge, but the designers eventually created a solution with a 4X4 foot solar panel and a dusk/dawn switch sourced from San Francisco's Urban Farmer Store. Paired with a car battery for power storage, the sun provides the power to run "Manifest Destiny! "'s cozy cabin lights throughout the night. Jenny Chapman discussed the multilayered meanings behind the title of the piece: "Manifest Destiny!". The theme represents the spirit of adventure embodied by pioneers, yet is also critical of the arrogance behind western expansionism and mistreatment of the west's existing inhabitants by settlers. The drive for a better life underlying the spirit of pioneerism is represented in the idea of Manifest Destiny, yet the concept also points to the idea that there was a god-given right to settle the territory. As Chapman put it, Manifest Destiny encompasses: "the horror of the native condition in California but also the enthusiasm of settling the West." As a piece of public art in a private space, the "Manifest Destiny!" cabin itself is inhabiting an "unclaimed territory" several stories above the ground. With one successful collaboration already under their belts, we look forward to seeing more surprising public works from Jenny Chapman and Mark Reigelman. To see the "Manifest Destiny!" cabin yourself, head over to 447 Bush Street in San Francisco before October 12th, and check out more details from arts grantmaking organization Southern Exposure.